It is said enough times that data is to 21st century what oil was to 20th century. But as the crude oil needs to be refined, similarly data needs to be refined before it can be made useful. There are various steps involved starting from raw data to reach to a useable insight. One often starts with a form of data which can be structured, semi-structured or unstructured. A structured data, as the name suggest is following some kind of structure, and easy to make sense of. This data might be in databases in form of tables or structured data files like excel sheets. A semi structured data also follows some structure but it is not as clean, for example a JSON or XML formatted data. All remaining data is unstructured, i.e. log files, video/ audio streams, text files etc. When we get the data, first step is to filter out useful data. Next step is to clean up data for example removing null values by meaningful data (use mean, median or mode), cleaning up the text data, finding keywords and tags etc. Once we have all the relevant data cleaned up (tidy data along with meta data), we need to find a good sample data set for our study. A good example of sampling is exit polls we see generally during election times. When predicting election results, a news agency cannot check with all the voters, so they have to get opinion from a sample set. It is important to choose sample data set correctly to get accurate results, for example if we have 30 percent high income groups voter, 40% middle income and 30% low income group in a constituency, whereas the news agency sampled 70% of high income group voters, they will definitely get incorrect results. Another important aspect is data visualisation. You need to find correct form of data visualisation to make sure data reaches out and makes sense to all stake holders. Histogram, Scatter plots, Box plots, Strip charts etc are used for visualising the data. We do have a lot of tools to help us in whole data gathering, cleanup , analysis and visualisation process. For example we can use Kafka to get the data to system. Mahut/ R/ Python reads the data and find the results to be used by stakeholders. This entry was posted in Machine Learning and tagged Machine Learning on March 11, 2018 by admin. Understanding probability of occurring of an event is an important part to understand in Machine learning and Data Science. so we have 6 outcomes which can fulfill this condition. After the simple probability, comes conditional probability. There might be some preconditions for an event to occur, which increases probability of the event to occur. For example, probability of “it will rain” gets increased if we already have an event “it will be cloudy”. A and B = probability of both events occurring together. We already know total outcomes for two dice being rolled is 36. Finally coming to Bayes Theorem, this gives relation between conditional probability and its reverse. You have 2 bags, say X and Y. X has 6 Green and 6 Red balls. Y has 4 Red and 8 Green Balls. one of the bags is randomly chosen and a ball is picked randomly. If the ball is Red, what is probability that it was taken from bag X. This entry was posted in Machine Learning and tagged Machine Learning on January 31, 2018 by admin. Machine learning itself is big area, but to get started one needs to be familiar with a few basic concepts of Statistics and Probability. Median- Sort the list, for even items, median is sum of the middle 2 numbers divided by 2. For odd items median is the middle number. Mode- Number that appears most often in the list. In this case it is 5. Variance- It is the measure of how the set of number is varying from the mean. This is calculated by finding difference of each number from mean and than squaring. Standard Deviation- The variance is figured by squaring the difference of mean and numbers in list. Standard deviation takes the square root of variance to reset the unit of original list. So in case variance was 0.67, standard deviation would be sqtr(0.67) or 0.81. This entry was posted in Machine Learning and tagged Machine Learning on January 20, 2018 by admin. Clustering, as the name suggest is simply grouping some random elements. Say, you are given points on a 2-D graph, you need to figure out some kind of relationship or pattern among them. For example you might have crime position in a city or Age vs Mobile Price graph for purchasing habit of an online website. 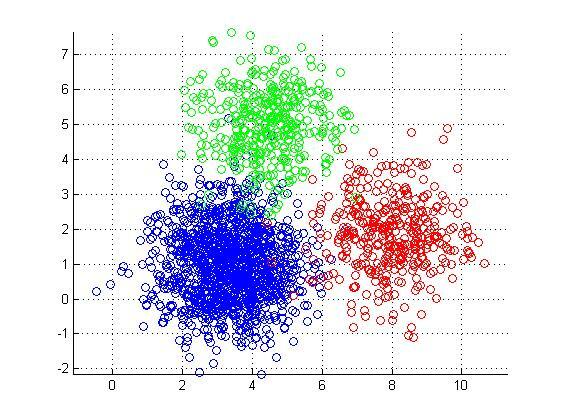 In Machine Learning, clustering is an important class of algorithms as it helps figure out a pattern in random set of data and helps take decision based on the outcome. For example, an online store needs to send a targeted marketing campaign for new Mobile phone launched. Clustering algorithm can help figure out buying patterns and single out customers who are most likely to buy the mobile phone launched. There are many clustering algorithms, K-means being one of the simplest and highly used. 1. Place K points randomly on the graph. These will serve as initial center points or centroids of the K clusters. 3. When all items are assigned a cluster, recalculate centroid of the cluster (point from where distance to all the items in cluster is minimum on an average). 4. Repeat step 2 and 3, until there is no scope of improvement (no movement in seen in centroids). The above algorithm will divide all the items into K clusters. Another challenge will be to come up with optimum value of K. i.e. 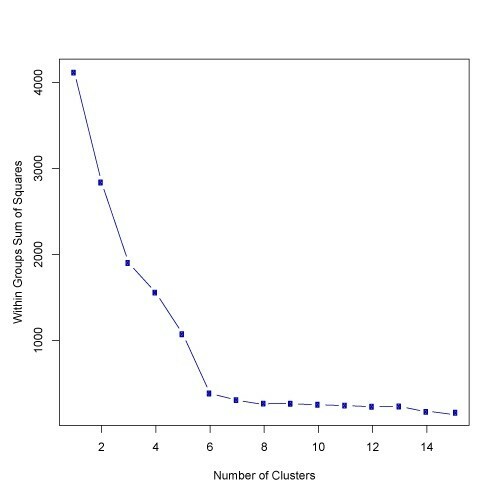 How many clusters can correctly or adequately represent the data. Well there are many ways to figure that, one of effective way is the elbow method. You start plotting number of clusters on X axis and Sum of squared errors on Y axis. Sum of squared errors is, you take each point in a cluster, find the distance from centroid and square it (to eliminate negative distances), this is the error for this particular point as ideally you want each point near to centroid of cluster to make it perfect. Then sum up all these errors and plot on graph. The resulting graph starts looking like an arm. We find out the elbow, that is, where we see the numbers getting flatter on X axis. This means any additional cluster is not adding too much value to the information we already have. This entry was posted in Machine Learning and tagged Machine Learning on January 19, 2018 by admin.